GEORGETOWN RUNNING CLUB: YOUNG - 2:49! Chevy Chase Running Company employee Lavar Curley runs 2:52:14. GRC turncoat Chris Sloane slows to 2:37 after hitting halfway in 1:12. Sloane also set a PR. Lisa Chilcote was 5th in the MCM 10k in 41:17. 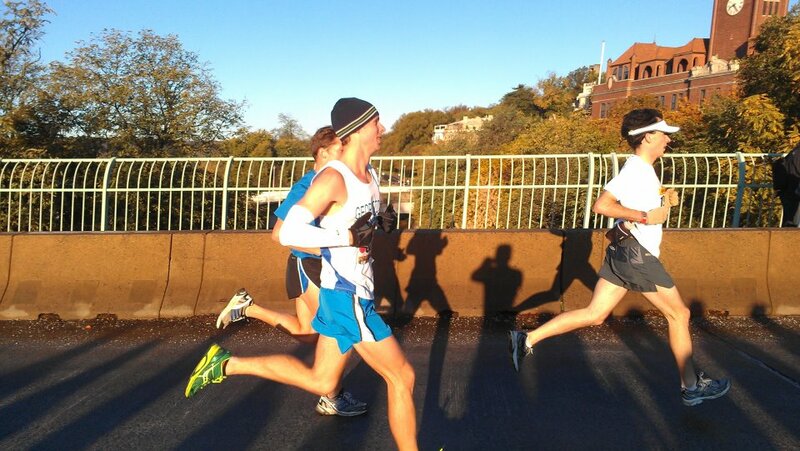 In other weekend racing news, Ryan Hanson wins the Goblin Gallop 5k in 15:46. Coach Jerry reports "Hanson ran controlled, pulled away from GRC Ethiopian on last hill." Jerry adds: "another strong run for Anna, and a great GRC debut for Kristie Connelly. Maura also runs a solid race." Susan Hendrick won the AIDS Run 5k in freezing rain on Saturday with a 19:05. It was indeed a wonderful day for racing in and around our Nation's Capital. I'm telling you. I have to shout out the unofficial performance of Andy Chicken Tender Runner Sovonick. CTR offered to run with me for a portion of my long run today, at a pace slower than he is accustomed, from the GRC store to mile 20. 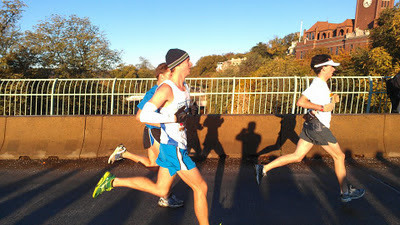 I was running with a Baltimore teammate who was looking to run under 3 hours. When I could no longer run at mile 20, Andy kept going with her and got her to mile 26 - a 17 mile run for him - and did a great thing. He earned his chix tends today! Klim - it was also great to see you, and to smell the booze from last night's festivities still on your person. Haha!